Nathaniel F. Wienecke was sworn in on August 21, 2006, as Assistant Secretary for Legislative and Intergovernmental Affairs of the U.S. Department of Commerce. Mr. Wienecke was nominated by President Bush on June 29, 2006, and confirmed by the United States Senate on August 3, 2006. In this capacity, Mr. Wienecke serves as the principal advisor to the Secretary on legislative issues and congressional relations and on the Department's relationship with state, county, and municipal governments and their associations. He manages these diverse efforts and the Department’s relationships with it 21 congressional committees of jurisdiction across the Department’s 12 bureaus. During his tenure he has worked on significant legislation including the passage of the Dominican Republic-Central America-United States Free Trade Agreement (CAFTA-DR), the Magnusson Stevens Fisheries Conservation Act of 2006, comprehensive immigration reform and the consideration of the Peru, Colombia, Panama and South Korea free trade agreements. Mr. Wienecke joined the Department of Commerce in August, 2001. 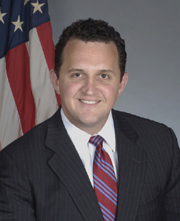 Prior to his current position he served as the Deputy Assistant Secretary for Legislative and Intergovernmental Affairs and as Acting Assistant Secretary from June, 2005 through August, 2006. He also served as Deputy Assistant Secretary for External Affairs and Communications, and Deputy Assistant Secretary for Congressional Liaison, Program Research and Evaluation at the Economic Development Administration, a Commerce Department bureau. There he was responsible for the facilitation of congressional and inter-governmental relations including the enactment of the Economic Development Administration Reauthorization Act of 2004. He was also responsible for directing the agency’s public affairs; and National Technical Assistance, Training, Research and Evaluation programs. Mr. Wienecke has served in the U.S. House of Representatives as senior staff on the Committee on Government Reform. He served as the committee's point man on procurement policy, where he kept a watchful eye over the myriad of contracts in which the federal government entered for purchase of civilian and military goods. He has worked extensively on issues related to federal telecommunications procurement, federal information technology modernization, energy policy and federal conflict of interest policy. Additionally, he was the Committee’s representative on the National Capitol Planning Commission where he engaged in all matters of urban planning and design within the District of Columbia. Mr. Wienecke, a native of Illinois, spent his formative years in New York and has a bachelor’s degree from the State University of New York at Oneonta. He began his Capitol Hill career as a legislative correspondent and later legislative assistant to Rep. Mike Forbes (R-NY). He then moved on to become a senior legislative assistant for Rep. Dan Burton (R-IN) where he focused on telecommunications, transportation and healthcare policy. Wienecke and his wife, Chantal, live on Capitol Hill and have one daughter, Kendall.